Govinda dasi: …in May of ’68? Govinda dasi: I thought it was in Boston. Jayadvaita Maharaja: I came up to Boston right after I joined. I was a devotee in New York for two months. Govinda dasi: So I was there at your initiation then. Govinda dasi: So my point here is that already Srila Prabhupada had been working on this, I don’t know how many years before, but Hayagriva had been working on this with Srila Prabhupada, and they went over things. They would discuss things. Hayagriva, he’s no longer present in this world, and I’m not, I’m just pointing out that Hayagriva was the person sent in at that time. And Hayagriva was, interestingly enough, an English professor with a PhD, and his specialty was poetry. And Bhagavad-gita means ‘Song of God,’ it’s a poetic treatise in Sanskrit. So somehow or other by Krsna’s arrangement, a specialist in poetry with a big bushy beard—and he as a rather far-out fellow, but he was a good writer, an excellent writer—was sent to Srila Prabhupada and Srila Prabhupada spent many, many hours with him. Now, for example there’s a simple change, “the Blessed Lord said.” That’s been removed, because you [Jayadvaita Maharaja] say that the original manuscript didn’t have that. But how do we know that in the two years, and the hours that he [Srila Prabhupada] spent with Hayagriva discussing things, that they didn’t discuss this point, that ‘the Blessed Lord’ sounds better than ‘the Supreme Personality of Godhead,’ or so many points that we really don’t know. We can’t possibly know; we weren’t there. We don’t really know that. We just know that Bhagavad-gita As It Is has, in 1968, ‘the Blessed Lord said.’ I’m taking that as a very simple, innocuous example. And we don’t really know where it came from. You [Jayadvaita Maharaja] say that you have the original manuscript, but yet the person who worked with the original manuscript isn’t here anymore, he’s deceased. I mean Hayagriva; I don’t mean Srila Prabhupada. I don’t refer to Srila Prabhupada like that. And so I don’t know whether or not… that’s one question. Now, how do we know that… Srila Prabhupada went over things very thoroughly. He went over this drawing. He corrected me, he watched what I was doing, many things. Teachings of Lord Caitanya, we also worked on the drawings for that while we were in Los Angeles, and I’m bringing this up because there’s a similar change in this regard. Teachings of Lord Caitanya originally had five or six black-and-white drawings. In those days we couldn’t afford to print color. So, Gourasundar and I did five or six black-and-white drawings, and Srila Prabhupada very meticulously went over them. He told us exactly what to put. I had never been in the Jagannath temple, I had never even been to India, and I wasn’t allowed in anyway. And he told me everything that was inside, where the pujari sits, Jagannath was up on this thing, it was dark all around—he gave me specific instructions on how to do that drawing; that drawing and all the rest that are in there. OK, this is my point. Number one, he made corrections according… for two years, before we were even around, Maharaja and I, I don’t know, I was in college and he was doing… I think you’re younger than me, so you were probably in high school, I don’t know. So basically, we weren’t around. While this is going on, a lot of things could have been occurring between Hayagriva and Srila Prabhupada that we don’t know about; that we can’t possibly know about. We just can’t know about them. However, given the way he managed the artists and the way the artwork was done, and the way the editing work was done later on, I would say he probably had a hand in it. OK, there’s another point. That’s my point as far as that’s concerned. Srila Prabhupada had a Midas touch: everything he touched turned to bhakti—even us. We basically had… we were kids, green behind the ears, and without a whole lot of punya, actually. A lot of us were taking drugs, a lot of us… I was in my fourth year of college, and I left school and met him three months later, and I felt he saved my life because I saw no meaning in anything. And I’m sure most of us feel the same way, wherever we came from. Srila Prabhupada had the Midas touch. His Midas touch—everybody knows who Midas was, the king that turned everything to gold. So, he infused, he oversaw the production of everything that happened, and he infused the artists and editors with his own bhakti. It was like a fever; it was wonderful, it was actually the best time in my life. Putting out those seventeen volumes of Caitanya-caritamrta and working around the clock; there’s probably nothing that you’ll look back on in your life that was more beautiful. It was like Srila Prabhupada’s divine presence permeated us all. It permeated our work. And you know, I look at some things that I did; I look at that painting above Srila Prabhupada’s head right there, and I don’t even think I did that painting. I look at that one, and I think, “I did that?” [note: several of Govinda dasi’s oil paintings hang in Srila Prabhupada’s room where the meeting is being held] Srila Prabhupada’s mood infused us, it gave us the ability… What is that verse in Caitanya-caritamrta, that the lame can cross mountains and the blind can see? He gave us, we were warm bodies, his energy came through us, and we did incredible works. Govinda dasi: Yes, and when I painted that, there was an incident where Srila Prabhupada let me know… The whole time I painted it, I wanted to paint it so that he would like it so much, that he would touch Lord’s Caitanya’s feet. I never told him that. Years later, years later, it used to be right here. He liked having it right here [next to his desk]. I was standing at the door, he came over to the painting, put his head on Lord’s Caitanya’s lotus feet, and left for the airport. And I thought, “Oh, he has satisfied my desire.” I mean, there are the experiences that we had with Srila Prabhupada. These are real experiences. Like Satyahit said, he used to fall down, he was so overwhelmed by Srila Prabhupada’s divine presence. He opened our hearts completely. So without getting too far off, my point here is that he guided us from within, and Srila Prabhupada didn’t want things changed. He was unhappy when we didn’t respect what he had done, and when they removed the pictures, he complained about it. But it was never corrected. To this day, I don’t think anybody even has those pictures except me, because I’ve got all the early books. So that’s one of my second points, so far as the human aspect of this, and the historical aspect of this. There’s one other thing that’s significant here. Srila Prabhupada guided us on all our drawings. Jadurani and I used to sit in his front room, and Srila Prabhupada sat in his bedroom. There was an arched window between, and he walked in and out of the room while we were painting. And this is how close a contact the writers and the artists had with Srila Prabhupada in the early days. We were very, very… a nuclear family, almost. Srila Prabhupada would pose for us sometimes. He would walk in and he would pose. Sometimes he posed for Krsna, to give us an idea how the flute and everything, the position. He posed for Hiranyakasipu with his arms up, and he posed for Nrsimhadeva at least once a day, that was his favorite pose. He would walk in and roar, and say, “I’m jumping out of the pillar!” [laughter] Honestly! Anyone who was there can tell you this. This is what the early times were like. I’m just painting this picture so you can understand where I’m coming from. And I think that’s the essence of how we should remain in his presence: there are many things we don’t know. Srila Prabhupada is the one who actually knows. He’s the one who actually guided all of this, in what: eleven years, how many times did he travel around the world, ten or twelve times? And in eleven years, he printed how many books? He did phenomenal things. We didn’t do this. None of us did this. We weren’t the doers; we were warm bodies who were willing to do what he wanted us to do. And his divine presence came through his books, and they were transcendental. He told everyone they’re transcendental: “Read my books. They’re transcendental.” So he accepted his books in 1972 as transcendental and perfect, and he lectured on them. He lectured on almost every verse of theBhagavad-gita As It Is over ten years’ time. Both of these Gitas: this one, [the “purple Gita”] which is almost unchanged, the translation; and this one, [the Macmillan Gita] which is much fatter and has more. He lectured on these for ten years, over ten years. And he only requested two or three small changes. And believe me, if he didn’t like something, he could break up a lecture and let you know it. He certainly laid into Dr. Radha-Krsna at least a dozen times that I can think of. Jayadvaita Maharaja: I never got an explicit word from Srila Prabhupada to do this work at an explicit time. Govinda dasi: Yes, at an explicit time, but not post-disappearance. Anyway, so the authority issue is there. And I think, Maharaja, that if you had simply changed some typos, some simple verse errors, and switched-around purports like you pointed out, and some obvious glaring things, I don’t think anyone would have raised this war cry at all. I think everyone would have said, “No problem.” But if you go over these Gitas, you’ll see that every page is full of changes from this manuscript that you describe. And the end result is choppy, it’s not a flow like what Srila Prabhupada had here. And we can’t think that Hayagriva did this. I think that to think that Hayagriva did these Gitas is not a correct view. Srila Prabhupada did these Gitas, and he did them through Hayagriva’s hand. And just like I didn’t do these paintings; I was just Srila Prabhupada’s hand. These are all things…even Jadurani, he used to say, “This girl didn’t know how to paint; now look at her artwork.” She became a great artist by the Supersoul within the heart, and by Guru’s guidance. Extraordinary things did take place. So those are my preliminary points, but the main point. The main point, and this is the bottom line point is: it is not a question of how you changed the Gita. It is not a question of your editing skills, or your personal abilities, which no one questions. You’re an excellent writer, you can translate many books and put out many Gosvami literatures, and put ‘adapted by Jayadvaita Swami,’ and nobody will complain. This is not the issue. 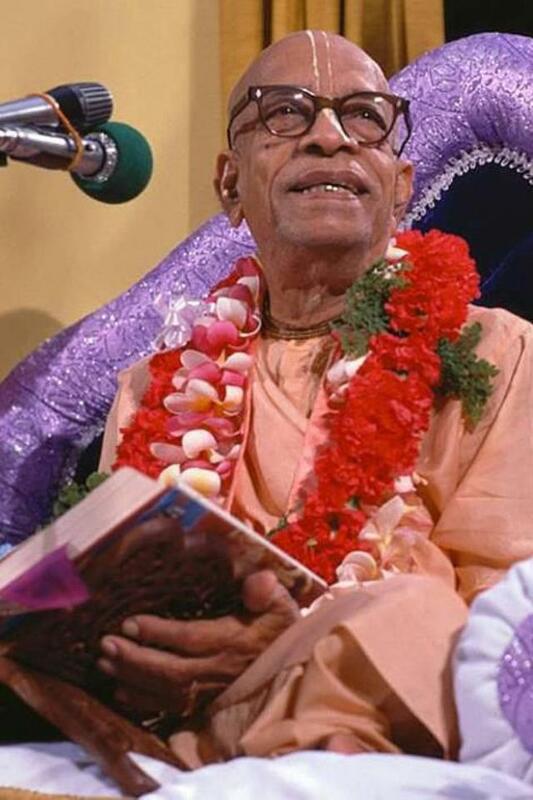 The issue is that post-disappearance, Srila Prabhupada’s books should not have been touched. Posthumous editing, and post-disappearance editing in the case of anacarya, is not accepted in the Eastern tradition or in the Western tradition. And this is the underlying problem. So it’s not… I think a lot of the discussions here have been based on the fact that you’re saying that according to this manuscript, you’re adding some things, changing some things, and correcting some things. And certainly that’s a valid point of view, but it’s missing something because it’s not the real issue that I’m addressing, or that I think a lot of these devotees are trying to address. The real issue is, you can’t change an author’s book once he signs his name to it, nor a painting. It ceases to be his work. Once Srila Prabhupada signed this book in 1972, the signature is in here. This is a personal signature, not a corporate signature, that’s different. Srila Prabhupada signed this May 12, 1971. He signed this one sometime before that, in 1968. So this one were already signed. This Gita that has been presented, the most recent abridged version, has Srila Prabhupada’s same signature in here, May 12, 1971. But actually, he didn’t sign this version [the new edited one]. He signed this one [the original edition], and this is the issue that we need to address. This is the issue that has to be addressed. One of the reasons is the ramifications, which are obvious. Ten years from now, somebody may say, “We don’t like this one [Jayadvaita’s edition], we think we can improve on it, we have the manuscript, and we can change it again.” And another twenty years from now, somebody else may do the same thing. And if you change a book one percent every year, in a hundred years what do you have? A hundred-percent different book. And that can happen: it’s happened to the Bible and it’s happened to other texts. And our concern is that we don’t want that to happen to Srila Prabhupada’s books. So, once an author has left… had you signed this yourself, that would be a different story. But putting Srila Prabhupada’s signature on this, as if it were his entirely, is not acceptable either from the scholarly point of view or from the devotee point of view. Of course, we’re more concerned with the devotee point of view. The scholars have their things to say also. I’ve got something from Dr. Holly Elgrin, she’s a PhD in anthropology and a philologist. She sent me information regarding bowdlerizing and the fact that bowdlerizing generally does not have a good connotation. It generally has a negative connotation. She says she can send me more stuff tomorrow, but my point is from a scholarly point of view, as well as from a devotee point of view, which we’re really much more concerned about, the idea of correcting post-disappearance or posthumously is not an accepted thing. You can’t edit Rupa Gosvami and sign Rupa Gosvami’s name to it. If you write something about Rupa Gosvami that’s written by Rupa Gosvami, you’re going to have to say, “Translated by Jayadvaita Swami, adapted by Dravida Swami,” you know what I mean? You’re going to have to put that. You can’t simply put Rupa Gosvami’s work, and then sign Rupa Gosvami’s name, anymore than you can Srila Prabhupada’s. And you can’t do it with Hemingway either. Hemingway says some things that are questionable in today’s society: he calls black people ‘niggers.’ That’s not acceptable; that’s a sociological offense. Maybe some people have tried to edit it, but it’s not respected. The author has to stand alone in his own time. And if you leave this gate open at this time in history, what can happen—and you love Srila Prabhupada as much as I do—his books can be edited again and again and again. And you don’t want that. I’m sure you don’t; I’m sure you don’t want his books to be bowdlerized again and again and again. Jayadvaita Maharaja: Can I interject something since I know him pretty well? Before you bring it up, let me just tell you a little bit about him, and see if you want to bring it up. The man is one of, he’s been a devotee since, decades. He’s one of the biggest organizers of book distribution of Srila Prabhupada’s books in the movement, now, today. That’s what I wanted to say. Jayadvaita Maharaja: You can call it the second edition. Govinda dasi: I’m just calling it what people commonly call it. Jayadvaita Maharaja: Let’s call it the second edition. Govinda dasi: Now, many people don’t even know about this, Maharaja. I have been a devotee 35 years, and I didn’t even know about it until 1997, when I was in Texas studying writing under Dr. John Trimble, because I happened to pick up one of these Gitas at the local temple, because my books were at home in Hawaii. So my point is, the underlying dangers here are the future edits, and another underlying danger is seeing Srila Prabhupada as an ordinary man, and that could happen in the future. Srila Prabhupada never wanted to be referred to as a man, remember I told the story last time about how he chastised them about the Back to Godhead magazine that had, “This man changed the world.” In the middle of the night he would call somebody as soon as he saw something with the insidious consciousness that ‘the guru is not divine.’ So this pernicious philosophy has actually led up to many of the problems, as you know, that we have had since His Divine Grace left us in 1977. After he left, a decade of forgetfulness ensued. During this era, many mistakes were made, many wrongs were done, and the confusion surrounding his disappearance was all-encompassing. I think for each and every one of us, no matter where we were on this planet, whether we were affiliated with ISKCON or independent. In 1996, Srila Prabhupada began to resume his center, his presence as the center of ISKCON again, with the Centennial. And now with the reinstatement of his original books, his main work will be at least preserved. When history views this era—you’ve got to remember here, we’re just little fleas; we’re going to be here 25 more years at the most—when history views this era 50 years from now, what will they see? They’ll see a lot of confusion over the last 25 years. There’s no question about it. Nobody can possibly shove it under the carpet; the carpet is too high off the floor. So they’re going to see the Vatical era, the Christians being thrown to the lions; they’re going to see a lot of confusion. Like the Dark Ages; something on that order. And all the people and the personalities here—you and I—we’ll be forgotten. Even 50 years from now, I doubt that most of us, 50 years or 100 years from now, we’ll be finished. So in these 50 years, with these players forgotten, people will want to know about Srila Prabhupada, they’ll want to know about his original books, they’ll want to know about him. And they’re going to want to know about the errors. So our duty is to correct these errors now, while we’re still alive; otherwise history will correct them for us—by unlimited versions of the Bhagavad-gita. If you leave the gate open, you can’t stop it, and I can’t stop it. There’ll be people who don’t like what you’ve done, so we can’t do that. So this is my point. Jayadvaita Maharaja: So again, it’s always a pleasure to hear from Govinda dasi about her experiences with Srila Prabhupada, and her realizations about Srila Prabhupada… [inaudible] I certainly think her ringing statement that there are many things that we don’t know… anyone who doesn’t know that is really going to have problems. Um, just in the interest of history, not to really make a case or anything, but just to clarify further some points that you clarified, because I think it was helpful. Not everyone knows the publishing history of, especially Bhagavad-gita or Srimad-Bhagavatam. [inaudible] Um, you did bring out a lot that was good. I’ll just fill in a few, a few things that aren’t generally known. Uh, one thing of course is that, that for the abridged edition, Hayagriva wasn’t the final editor. Um, he… there were two hands [inaudible] I don’t know whether it was together or separate, but finally Rayarama turned out, as the… because Hayagriva left devotional service for some time, and Rayarama finished the book. And in the interim, I think, between his having finished it and its publication, he had trouble also, and to the extent that Srila Prabhupada offered that he could have his name as the author, that Rayarama could have his name as the author. Um, there’s a letter to that effect in the BBT folio. Govinda dasi: What? I don’t understand the import of what you’re saying. Jayadvaita Maharaja: Um, well, basically Prabhupada was, um, said to… he was having so much difficulty with this Rayarama, um, Prabhupada said to, I don’t think it was Hayagriva but, um, my memory is a little unclear, but I think there was this letter that he could have his name on it, but I don’t think it was Hayagriva. [Editor’s note: A diligent search of the Folio failed to turn up the letter referred to by Jayadvaita Maharaja. However, one letter was found [69-11-25.Bra] to Brahmananda wherein Srila Prabhupada writes as follows: “The idea is that BTG is our backbone of Krishna Consciousness propaganda, and since you have taken charge from Rayarama’s hand, certainly it has improved in so many ways. Recently I have received one letter from Rayarama which he has signed his name to as “Raymond”. That means he has drifted from our society completely and his letter is very discouraging. He has accused everyone save himself. So I do not know what can be done with him. Jayadvaita Maharaja: Anyway, he was the final editor. [inaudible] The unabridged edition, uh, the unabridged edition, um, I was the production manager at the time…[inaudible] and, for that edition, Hayagriva had some manuscripts already with him. And, he called for whatever other manuscripts we had available at that time at ISKCON Press. Parenthetically I might insert, that not by virtue of any special qualification or skill, but more by historical accident, I wind up being the historical expert on manuscripts of Bhagavad-gita As It Is. Um, I worked with all of them, uh, before the book came out. I worked with… I worked with all the… I worked with Hayagriva’s manuscripts; I worked with manuscripts that Hayagriva had not yet edited; I worked with manuscripts that Rayarama had worked on; I retyped the entire Bhagavad-gita As It Isfrom, from beginning to end; I transcribed some of the missing portion from the Ninth Chapter; I don’t think I transcribed it actually, but I, I was the editor for that, so I know what those things are; um, I don’t think anybody has spent more time with the manuscripts of Bhagavad-gita As It Is than I have. Um, I’m familiar with the quality of the manuscripts, the variation in quality of the manuscripts, um, I just know the manuscripts… really well. Um, the way that ornithologists know birds, and uh, everybody else knows whatever they’re most into, uh, I know those manuscripts really well. I know which ones are unquestionably Prabhupada’s work, I know which ones are unquestionably heavily edited, and retyped so that you can’t tell what Prabhupada did and didn’t say. [inaudible] Um, I know which ones were dictated, I know which one’s weren’t dictated, which ones were typed and not dictated. I just really know those manuscripts well. So when, um, one could naturally express doubts about ‘how do you know which is the original manuscript?’ I just happen to be the world’s expert at it. Not by, again, not any great qualification, just because somehow or other I was there with them. Um, not at the time the first edition was made, but a long time after that…[inaudible] Um, and if anybody wanted to go through, you know, any section, say, and how do you know that this is, uh, what is this, uh, you know? I feel pretty confident about my ability to say what it was; how we know what it was. Govinda dasi: You mean there were errors? Jayadvaita Maharaja: Um, I mean there were, um, yes. Jayadvaita Maharaja: No, I don’t mean typos. I mean, um, no, I’m reluctant to talk about it, Govinda dasi. I’ve always had the policy that as a matter of professional courtesy and personal courtesy, um, I talk about all positive things, um, in the editing of the first edition. And as far as possible I’d like to keep that policy. I just say, to make a long story short, that there were things… in the manuscript that came to me that Srila Prabhupada would not have approved. [inaudible] Um… [inaudible]. Govinda dasi: That was when Srila Prabhupada was present. Jayadvaita Maharaja: Yes, that was before the second edition was published. [inaudible] Well, I went back and forth with Hayagriva Prabhu, who had just returned to Krsna consciousness, uh, [inaudible] Kirtanananda Gosvami, and… [inaudible] and they came back. Govinda dasi: Srila Prabhupada wrote letters, “I am shedding tears every day, wondering how my boys will come back,” something like that. Jayadvaita Maharaja: Right. Prabhupada was so pleased that they came back. Govinda dasi: The way he would go… their hearts would have to be made of stone, not to melt. Govinda dasi: He really, really loved Hayagriva. Jayadvaita Maharaja: He really did. Govinda dasi: He really did. It’s like, he was a really, um, [indistinct] big-bearded, I don’t think he ever shaved that beard off, and he was a professor. You know how professors are. Jayadvaita Maharaja: And, you know, as they say, Mr. Bennet, my, uh, high school English and math teacher, he used to tell us that, “It all comes out in the wash.” The purport of which is that, I think it would be fair to, um, appreciate Hayagriva Prabhu but how he ended his career in Krsna consciousness, you know, like what happens at the finish line, and uh, you know, I think you can see that this person crossed the line. Govinda dasi: Very much so. He was actually sincere. His heart was very sincere. Jayadvaita Maharaja: Yeah. A sincere person. But he had his problems. Govinda dasi: Yeah, he had his problems. But he as so sincere, and he did have really good credentials. Jayadvaita Maharaja: You can say that the extent to which Srila Prabhupada was in touch with the manuscripts was to the extent that he was aware of things from afar. But apart from that, he wasn’t involved. Jayadvaita Maharaja: He read from the book so many times. Jayadvaita Maharaja: Um, in the course of production I wrote to him about 2.12; you read the answer, Prabhupada said it was OK. Um, I wrote to him about some missing verses; you read about that also, there was a section in the Ninth Canto, the purports I think, there were just no purports for that stretch of verses. I wrote to Srila Prabhupada and said, “There are no purports,” and Prabhupada dictated the purports, and sent manuscripts. Govinda dasi: Then you transcribed them. Jayadvaita Maharaja: Um, no, he sent the manuscripts. No, um, I forget whether he sent the manuscripts, or whether he sent a tape and I transcribed it. I’m not quite sure. In any case, He sent me the missing material. [indistinct] I just want to contribute that much to the history, that translations were extensively redone, and the purports were edited without Prabhupada’s participation. That’s what I was saying. Um, OK. The translations also differed considerably between the abridged and unabridged. Not… to some extent. Now I wanted to address, I guess, a, uh, what’s perhaps a mundane issue that takes a transcendental turn. This is his point about posthumous editing. And the first point is that neither in academia, or neither in the world of literature or in the world of transcendence, neither in the East nor in the West, is it, um, approved. And that’s simply, um, that’s either untrue or exaggerated. Um, I’d like to know first of all what this bowlderization [sic] thing is. Because I feel unprepared for what Keli and [indistinct] said last time around. I wasn’t familiar with the term, and I wasn’t familiar with the arguments, so [indistinct]. Um, the primary meaning of bowlderization [sic] as she mentioned, is still the essential meaning, is, um, basically gutting a work. When, uh, to expurgate a book or writing by omitting or modifying words or passages considered indelicate or offensive. That’s the primary meaning of bowlderize [sic]. This entry was posted in All posts, Arsa-prayoga, As remembered, BBTI, Bhagavad-gita As It Is, Changed pictures and paintings, Debate, Examples of changes, Govinda Dasi, Jayadvaita Swami, No authorization, Prabhupada said and tagged arsa-prayoga, authorization, bbt, BBTI, Bhagavad-gita, blueprint, debate, editing protocol, examples of changes, Govinda Dasi, Hayagriva, Jayadvaita, memories, posthumous editing, prabhupada. Bookmark the permalink.